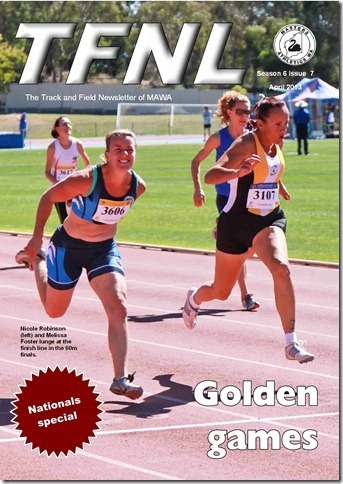 AMA 20K Walk Championships will be held on Sunday 30 June 2013 at VRWC, Middle Park, Melbourne, Victoria. See AMA Website for further information and entry form. The rain gods smiled down on us for the 25th running of this event. There had been rain forecast for all the previous week and for the next week but after a shower in the late afternoon it cleared up to be a beautiful cool, windless evening, though the humidity seemed to be about 99%. After worrying that we were going to be short of helpers enough turned up on the night to help and make the event go smoothly. Our thank to those that came along. First home was new member Colin Shaw but as he had no handicap (on the club’s handicap list) he was ineligible for the trophy. The winner therefore was Robin King, who says this is one of her favourite events, with Bronwyn Smith close behind. Fastest run was by Ross Langford. A good group stayed on for the BYO barbeque after the run. A big THANK YOU to all who helped to make the event a success, some who come along every year. Thanks also to Lorraine for typing the results and Maurice for the timing equipment and all those who ran. A reminder that the MAWA AGM will be hald on Wednesday 24 April at 7.00pm at the Hockey Club Rooms, Perry Lakes Drive, Floreat. Please come along and support your Club. Tea and coffee will be provided, please bring a plate of supper to share. Please see Geoff Brayshaw’s report, Treasurer report to AGM 2013. This includes the Treasurer’s report itself along with the Audited Financials and the Auditor’s report. Geoff will address any questions on these reports at the AGM next Wednesday 24th April. Other information on the AGM can be found under the ‘about us’ tab. This edition highlights some of the performances of the WA athletes and several athletes have contributed their thoughts on the championships and their own performances. Team manager, David Carr, writes a short review of the championships. Statistician, Campbell Till, trawls through the results to collate MAWA’s Australian and State records from Canberra. Carmel Meyer writes on her first Nationals. Andrew Brooker remembers when he lived in Canberra and competed in Little A’s. John Collier describes a different approach to pre-race routine to score a season best in the 800m. Gillian Young describes her favourite event of the meet. Rudy Kocis talks about his gold medal in the 200m when he thought he would only score silver. Vicki Cobby discovers she ran n someone else’s spikes while the spikes owner had to run in sneakers. Women’s relay co-ordinator, Margaret Saunders, writes on WA’s gold medal relays.